Hail to the new king of graphics cards, baby. Speaking of super cool features limited to Nvidia’s new graphics cards, there’s Ansel, which Nvidia calls “an in-game 3D camera” and I call the supercharged future of screenshots. Rather than simply capturing a 2D image like Steam’s F12 functionality, Ansel lets you pause a game, then freely roam the environment with a floating camera (though developers will be able to disable free roaming in their games if desired). You’re able to apply a several filters and effects to the scene using easy-to-use tools, as shown in the image below, as well as crank the resolution to ludicrous levels. Nvidia plans to release more filters as time goes on, plus a post-processing shader API so developers can create custom filters. 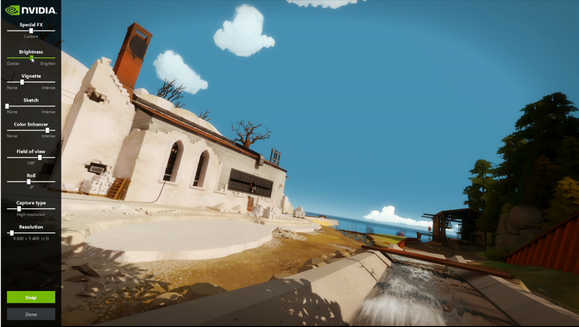 Nvidia’s Ansel will give you the ability to take a Kodak moment in a video game. Creating a masterpiece like that takes Ansel several minutes to stitch together files of considerably large size, however. Ansel snaps up to 3,600 smaller images to capture the entire scene—including 360-degree pictures that can be viewed in a VR headset or even Google Cardboard—and processes them with CUDA-based stitching technology to create a clean, final picture that doesn’t need any additional lighting or tone-mapping tweaks. It’s also capable of capturing RAW or EXR files from games, if you feel like tinkering around in HDR. Ansel’s a driver-level tool, and games will need to explicitly code in support for it. On the plus side, doing so takes minimal effort—Nvidia says The Witness’s Ansel support required 40 lines of code, while Witcher 3’s integration took 150 lines. 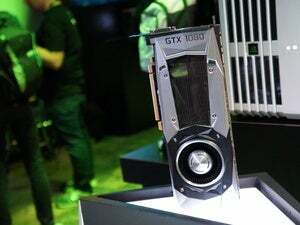 The company also plans to offer Ansel for Maxwell-based GeForce 700- and 900-series graphics cards. Look for The Division, The Witness, Lawbreakers, Witcher 3, Paragon, Unreal Tournament, Obduction, No Man’s Sky, and Fortnite to roll out Ansel support in the coming months. The GeForce GTX 1080 has a big problem: It’s almost too powerful, at least for the popular e-sports titles with modest visual demands. 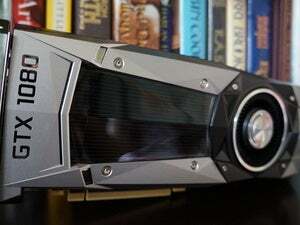 Running Counter-Strike: Global Offensive, League of Legends, or Dota 2 on a modern high-end graphics card can mean your hardware’s pumping out hundreds of frames per second, blowing away the refresh rates of most monitors. That puts gamers in a pickle. The disparity between the monitor’s refresh rate and the extreme frame output can create screen tearing, a nasty artifact introduced when your monitor’s showing results from numerous frames at once. But enabling V-sync to fix the issue adds high latency to the game as it essentially tells the entire engine to slow down, and high latency in the fast-paced world of e-sports can put you at a serious competitive disadvantage. The new Fast Sync option in the GTX 1080 aims to solve both problems by separating the rendering and displays stages of the graphics process. Because V-sync isn’t enabled, the game engine spits out frames at full speed—which prevents latency issues—and the graphics card uses flip logic to determine which frames to scan to the display in full, eliminating screen tearing. Some excess frames will be cast aside to maintain smooth frame pacing, Nvidia’s Tom Peterson says, but remember that Fast Sync’s made for games where the frame rendering rate output far exceeds the refresh rate of your monitor. In fact, enabling Fast Sync in games with standard frame rates could theoretically introduce stuttering. So yeah, don’t do that. The results seem impressive. 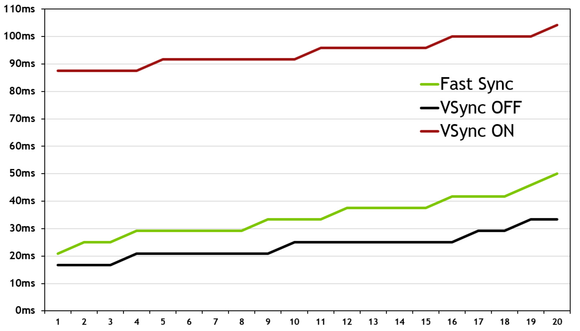 Here are Nvidia-supplied latency measurements tested with CS:GO. Look for Fast Sync to expand beyond Pascal-based graphics cards in the future. “Expect [GPU support] to be fairly broad,” says Peterson. 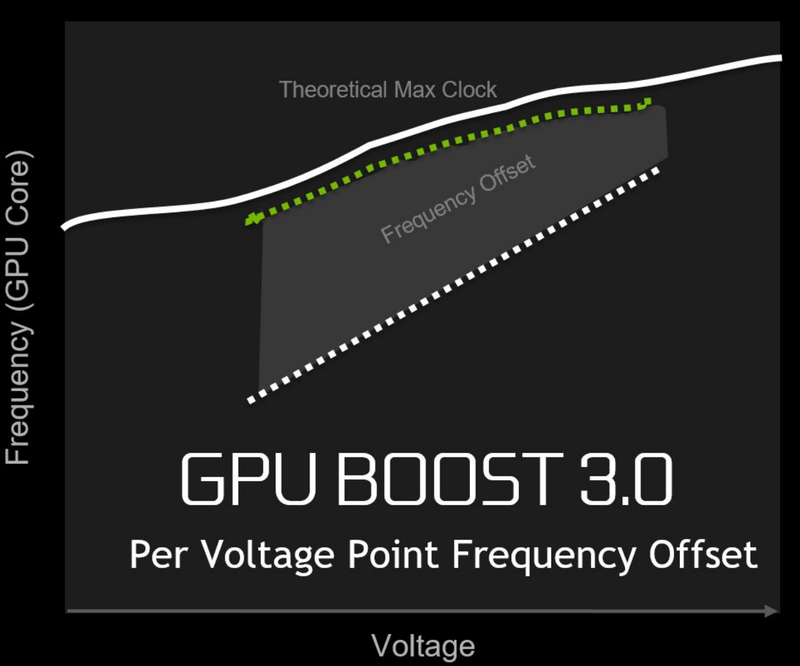 Nvidia’s rolling out a potentially killer new overclocking addition in the GTX 1080, dubbed GPU Boost 3.0. The previous methods of overclocking are still supported, but GPU Boost 3.0 adds the ability to customize clock frequency offsets for individual voltage points in order to eke out every tiny little bit of overclocking headroom, rather than forcing you to use the same clock speed offset across the board. Overclocking tools will scan for your GPU’s theoretical maximum clock at numerous voltage points, then apply a custom V/F curve to match your specific card’s capabilities. It takes all the guesswork out of overclocking, letting you crank performance to 11 with minimal hassle. Nvidia supplied reviewers with an early, mildly janky copy of a new EVGA Precision X build that supports GPU Boost 3.0, and finding then pushing your card’s limits proved pretty straightforward. Settings let you choose the minimum and maximum clock speed offset to test, as well as the “step” value, or how much the clock frequency increases from one offset to the next. After my card repeatedly crashed with Precision X’s normal OC scanner settings, decreasing the step value increase from 12.5MHz to 5MHz calmed things down—but also caused the scan session to become abominably slow. If I’d had time to let it run in full, I would’ve been left with a highly granular overclocking profile specific to my individual GPU. 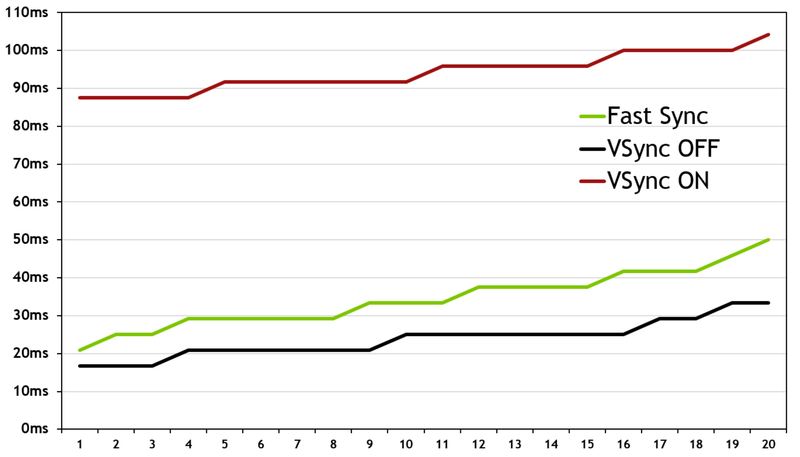 But because the tool landed my hands late in the testing process, I went the manual route, overclocking the GPU by hand with a copy of the Unigine Heaven benchmark. I’ll share the final results in the performance section. The GeForce GTX 1080 continues Nvidia’s tradition of supporting technology built for home theater PCs. After the GTX 960 and 950 became the first major graphics cards to support HDCP 2.2 for copyrighted 4K videos over HDMI, the GTX 1080 embraces high dynamic range video technology, a.k.a. HDR. HDR displays boost brightness to create more range between darkness and light. As simple as it sounds, the improvement in visual quality is borderline startling—I think the difference between HDR and non-HDR displays is much more impressive than the leap from 1080p resolution to 4K displays. AMD’s Polaris GPUs will also support HDR. Pascal GPUs support HDR gaming, as well as HEVC HDR video encoding and decoding. Pairing the GTX 1080 (and its HEVC 10b encoding abilities) with an Nvidia Shield Android TV console (and its HEVC 10b decoding abilities) enables another nifty trick: GameStream HDR. Basically, you can stream a PC game from your Pascal GPU-equipped computer to your TV via the Nvidia Shield, and because both devices support HDR, those deep, deep blacks and vibrant colors will appear on your television screen just fine. It’s a smart way for Nvidia to leverage its ecosystem and skirt around the fact that HDR display support is limited to traditional televisions right now, though it won’t roll out until later this summer. Currently, Obduction, The Witness, Lawbreakers, Rise of the Tomb Raider, Paragon, The Talos Principle, and Shadow Warrior 2 are the only games with pledged HDR support, though you can expect more titles to embrace the technology as hardware support for it becomes more widespread. ​Pascal GPUs are also certified for Microsoft’s PlayReady 3.0, which allows protected 4K videos to be played on PCs. Presumably thanks to that, Pascal-based graphics cards will be able to stream 4K content from Netflix at some point later this year. Embracing 4K video on the PC means embracing Windows 10 and DRM as well, it seems. The Nvidia GTX 1080’s port selection. To push out all those fancy new videos, the GTX 1080 packs a single HDMI 2.0b connection, a single dual-link DVI-D connector, and three full-sized DisplayPorts that are DP 1.2 certified, but ready for DP 1.3 and 1.4. That readiness enables support for 4K monitors running at 120Hz, 5K displays at 60Hz, and even 8K displays at 60Hz—though you’ll need a pair of cables to run that last scenario. Next page: Testing setup, SLI changes, and WTF is the GTX 1080 Founders Edition? The Nvidia GeForce GTX 1080 is the first graphics card built using 16nm technology after GPUs stalled on 28nm for four long years. The performance and power efficiency gains are nothing short of astounding.